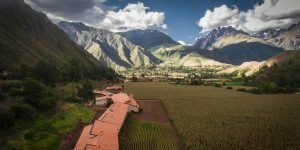 The Sacred Valley – located at the heart of the ancient Inca Empire – is a particular mix of natural and cultural beauty that has attracted explorers and travelers for hundreds of years. It serves as the gateway to overwhelming landscapes, local culture, and history. 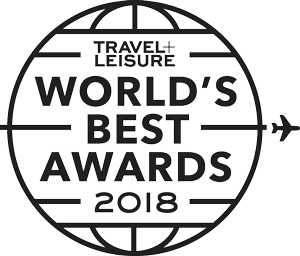 Trek Travel is proud to partner with explora, a renowned travel company that owns and operates incredible lodges in seven remote destinations of South America, for this exceptional itinerary in Peru. This in-depth exploration of Peru mixes active recreational activities with the luxury of one incredible home base at explora. The Sacred Valley and Machu Picchu are destinations with endless exploration possibilities. 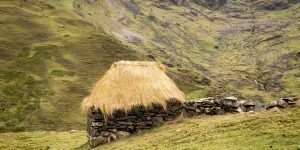 We take travelers through the colonial history and the architectural magnificence of the Incas in Machu Picchu, past isolated villages and archaeological sites like Ollantaytambo, Moray, Chinchero and Pisac, and to Andean pampas and mountains or "Apus" which are considered by locals as guardians of people and nature. You'll discover traditional towns barely touched by civilization along with ancient ruins perfectly preserved from the passing of time. This trip includes everything you would hope for out of a visit to Peru. 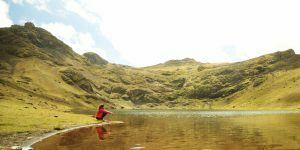 Multi-sport options that discover parts of the country you could never experience without a local guide, incredible lodging and amenities, local Peruvian cuisine and of course a signature trip to Machu Picchu. Welcome to Cusco! The city sits nestled in the heart of the Peruvian Andes and perched on top of the world. Your Trek Travel guides will welcome you warmly at the airport with a ride to your hotel for the week. Here, we'll enjoy a hearty gourmet lunch in preparation for the first ride of the trip. 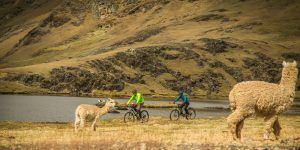 After lunch, your guides will then familiarize you with your Trek bike, including an informal fit session along with safety talks and expectations for the week. Then, it's off on our first mountain bike ride, starting with a gravel road that takes us down the south side of Urubamba River, through quiet, peaceful cornfields, and past old haciendas and manors from the 19th and 20th centuries. We'll keep it light and easy, using this first spin to acclimate to the altitude (9,829 feet at the highest point) and terrain. A support vehicle is available should you wish to shuttle for any portion of the ride today. Upon our return, take the rest of the day to unpack and unwind at the hotel. Tonight, we we'll gather for an aperitivo and first dinner together, prepared from fresh and seasonal ingredients. After a delicious breakfast, we'll take a private shuttle (50 minutes) and begin the day with a visit to the community of Cuper Bajo to learn about the process of making textiles, a local industry. Then, we'll enjoy a nature hike, taking in panoramic views of crystal-clear lagoons and crops on our way to the town of Chinchero. This undiscovered gem sits in the shadow of the hulking mountain of Salcantay and is home to some of the most famous Peruvian weaving and local art. 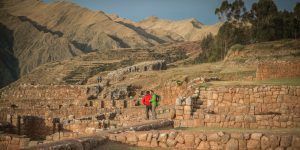 We'll descend into its archaeological complex, where Inca architecture fuses with colonial structures to create Syncretism. 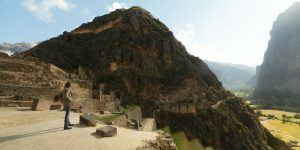 Ultimately, our walk will take us to the Machu Qolca archeological center, formerly used as a warehouse to store products for the Inca, where we'll stop for lunch at a particularly beautiful spot for views. Then, we'll get on our bikes for a descent down a long, winding gravel road to Huayllabamba in the Sacred Valley of the Inca. It's smooth sailing from here, through more expansive farmland, back to our hotel. We'll gather this evening for another fun social hour and dinner at the hotel. Awaken refreshed as your body becomes acclimated to the altitude. The Sacred Valley region is speckled with farms, large gardens, and small villages. We'll take a private shuttle for one hour to arrive at our first stop at the Moray experimental crop center. The archaeological feature resembles a crop circle, where concentric circles sit at different elevations for the Inca to try out different crops at different altitudes. Then, it's on to the colonial town of Maras, known for its pristine salt mines and pinkish hue. 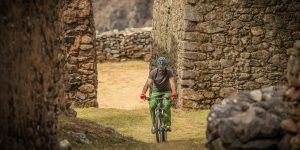 Take some photos and refuel for the ride back, as we then take our bikes through the highlight of the day: a combination of gravel roads and single track and a descent back to the Urubamba River. There are some exposed sections today, but nothing that is long or not walk-able should you not wish to ride. We'll stop for lunch in the middle of the valley, then head back to the hotel on a 40-minute shuttle, where the afternoon is yours before we gather again for social hour and dinner. Today is the crown jewel of the trip. In this full-day exploration, we'll travel to the famous historical sanctuary of Machu Picchu, one of the most impressive architectural feats of the Inca civilization and a wonder of the world. 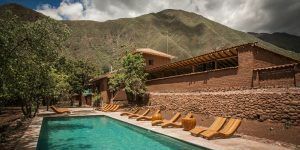 The itinerary begins early in the morning with a shuttle to the Ollantaytambo rail station, located 45 minutes away from the hotel, where we take a 1.5-hour train ride to the town of Aguas Calientes. From there, we'll board a quick 20-minute bus to Machu Picchu, and arrive at the entrance to the sanctuary at around midday. This is the starting point of our journey on foot to Inti Punku, or the Sun Gate, the ancient checkpoint to enter the citadel and the beginning of the Inca Trail from Machu Picchu. This challenging 1.2-mile hike can be done at a leisurely pace, as it is considered moderately difficult. Take the time to enjoy the once-in-a-lifetime view by the Sun Gate. At the end of the hike, we begin touring the most famous locations in Machu Picchu. You'll see the Sacred Plaza, Hut of the Caretaker and so much more. Dinner tonight will be back at our hotel, where we'll toast to a week of high-altitude excitement and archaeological adventure! For those not interested in touring Machu Picchu, other options will be available at explora. We arrive back this evening fairly late, so it's likely you will want a quick bite before you rest for the night. Tomorrow is our final day together in the Sacred Valley, and we have an incredible hike and bike adventure planned. Today, we'll venture by bike into the Sacred Valley and over a mountain trail with panoramic views of Cusco and the valley below. Our destination will take us over 14,000 feet above sea level, so come hydrated and with plenty of sunscreen! 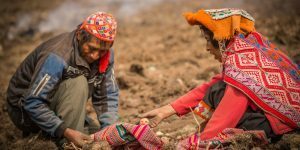 The descent includes a pass through potato plantations and treeless plains, or "pampas," of shepherds tending to animals. This afternoon, we'll start our ride from these pampas, descending down through indigenous Quechua communities and farms. We'll be treated to sweeping views of the Sacred Valley and Pisac, a picturesque area you'll want to capture without a doubt. Then, it's back to the hotel for some personal time before the social hour and dinner. It's time to say goodbye to the ancient history and vast natural beauty of this Peruvian landscape. Choose to indulge in one more half-day exploration, or relax with a cup of coffee and enjoy the serenity of the day. Today we fly out of the Sacred Valley back to Lima. Checkout is at 11:00 am, and lunch will be provided at 1:00 pm. Transportation to the airport will be provided after lunch. Trek Travel is excited to partner with explora - a respected leader in the adventure travel industry throughout South America. explora Valle Sagrado distinguished itself as the premiere luxury adventure travel destination for the Peruvian regions of Cusco, Machu Picchu and the Sacred Valley of the Incas. This is an all-inclusive, luxury level experience with full access to the spa and use of the on-site amenities. We suggest that you arrive at least one day prior to the start of the trip which will minimize the risk of travel-related delays. 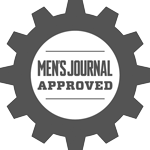 We recommend that you fly into Alejandro Velasco Astete International Airport (CUZ). From there, you can take a taxi to any of our recommended hotels in Cusco. Your Trek Travel guides will meet you at the JW Marriot Hotel (Esquina de la Calle Ruinas 432 y, Calle San Agustin, Cusco 08001, Peru) at 11:00 AM on the first day of the trip. From there, we will shuttle approximately one hour to Sacred Valley. Please have your riding gear in your carry-on and separate from your luggage. Your guides will fit you to your bikes and before long, you'll be off on your first ride of the week! If you'll be late for the pick-up or are going to miss it altogether, please inform your guides. You'll receive an email a week before the trip start with their names and contact details. If you cannot reach them, please call our hotel, explora Sacred Valley (+51.84.300.000), and leave a message with your expected arrival time and contact details. You will say farewell to your guides at 11:00 AM at the explora Sacred Valley and take a short private shuttle to the Alejandro Velasco Astete International Airport, arriving around noon. Please do not schedule any flights before 2:00 PM. 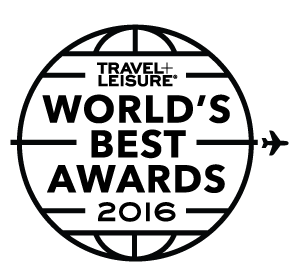 Savor timeless luxury at JW Marriott El Convento Cusco. Housed in a restored 16th-century convent in the heart of Cusco, this boutique hotel offers the perfect blend of historic grandeur and modern comfort. 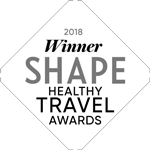 During your stay, find sanctuary in the sophisticated rooms that offer a range of amenities including elegant marble bathrooms, deluxe bedding, mini-bars and an oxygen-enriched system to relieve altitude sickness. The Novotel Cusco hotel is located in the historic center, close to Cusco's main attractions: the Plaza de Armas, the 12 Angle Stone, the viewpoint at San Cristóbal church and the Qorikancha temple. It features modern and colonial architecture with large rooms and free WIFI. Relax in the shade of the covered courtyard, sample a courtesy coca tea or try the restaurant's international cuisine. You can also enjoy live music from the comfort of the climate-controlled terrace. A storied mansion dating back nearly five centuries, Palacio del Inka stands in the historic center of Cusco. Directly across from the Koricancha, it is a five-minute walk from the main square and less than a mile from an array of museums, markets and restaurants. The guest rooms feature modern amenities. The Andes Spirit Spa presents indigenous treatments and an indoor therapy pool. Inti Raymi Restaurant offers authentic Peruvian dishes.